Will's Korean Journey: Funny Korean Rules and Habits. A list with pictures of Funny Korean Rules and habits. Don't ask me why they have these but they do. 1. You cannot wear outside shoes indoors. If there is a major event at my school, people are expected to either A, bring their own indoor shoes, B walk with no shoes on, or C wear plastic bags over their shoes. 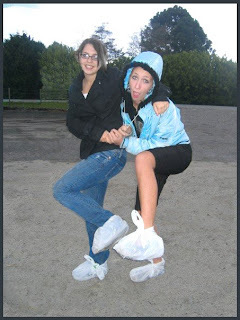 Yes, plastic bags. It's rather ridiculous and looks like this only more ridiculous because you are INSIDE. The last time I had to wear something over my shoes I was walking around the Winter Palace in St. Petersberg. There I can understand, but to walk into a gym. Come on. 2. Separating out your trash. Now I understand the need to separate your recyclables from your trash. I also understand that some people separate a lot more out of their trash for recycling. My father is one of those people. We recycle more then the average household. However, separating out your liquid trash from your non-liquid trash is a little weird. I mean, in the states you just dump your excess liquids in the trash. Yeah, for anyone who has ever worked in the food service industry that trash is disgusting, but still. They designed a separate receptacle for liquid trash. 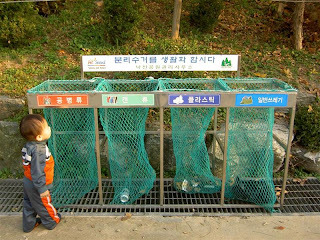 They also have separate trash cans if and or when, you can find public trash cans, they often look like this. Most the times they don't have pictures either. 3. 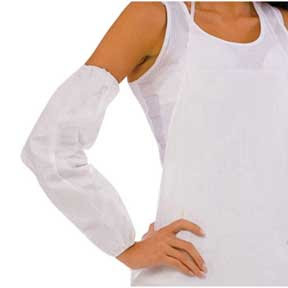 Sleeve protectors. These things are pretty great. I even understand their usefulness. However, you cannot truly take anyone serious who is wearing these things in bright pink with little animals for the design. It's just not possible. I try so hard not to laugh, but I end up ultimately failing. At least their sleeves are clean, no considering the biggest problem presented by eating with chopsticks is dropping stuff on your shirt, they need to issue bibs like these. That would be epic. 4. The Soju Tour. Now, anyone who has worked as a teacher in Korea, or just simply worked in Korea and went to dinner with your Korean boss knows what I'm talking about. Koreans love to have dinners at restaurants where the entire school goes to dinner. At these dinners, it is expected that at some point you make rounds with a bottle of Soju. Soju for those of you who don't know, is the Korean National Alcohol. It's a lot like Sake, only nowhere near as good. This stuff taste's like watered down Vodka, and has the punch of, well watered down Vodka. While you're doing this tour, it is required that you go have at least one shot with your boss. 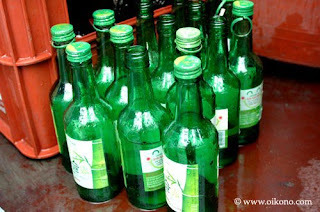 The problem is, if you have 50 teachers, and every teacher is doing a Soju tour then the boss has at least 50 shots of Soju. Anyone seeing the problem yet? They way they mitigate this issue is by pouring partial shots. Often times they will lift their glass after 1/4 pour indicating that you should stop there. Now, when you do this, they keep right on pouring. This tour, and those unfortunate foreigners who have been forced to go upon it know that this is the easiest way to drink two bottles of Soju in thirty minutes ever. You just do shot, after shot, after shot. Luckily people might let you get away by doing this tour with beer. In that case it's a lot of fun, however that doesn't stop the people from walking around with Soju stopping at you and making you do a shot. Remember, it's rude to say no. 5. The Drunken Support System. This goes out to all the Koreans, who, instead of drunk driving, go drunk walking. While this is a far safer then the other option, it does lead to some hilarity. Koreans to help reduce the chances of an accident have decided that when engaging upon these walks, the buddy system works best. Why should one drunk person walk alone. They get at least two other really drunk people to join them. Interlinked arms are the trademark of this support system. What is better then one person stumbling and weaving? I know, three people stumbling and weaving together. This way they can effectively block the entire sidewalk. The people also tend to be very loud and uncoordinated due to a probable consumption of two or three bottles of Soju. Recycling is a good thing. I never said it wasn't a good thing.